If you’re looking for a red hair color that’s got more cool notes than a natural redhead’s color, mahogany could be the red-hot shade for you. 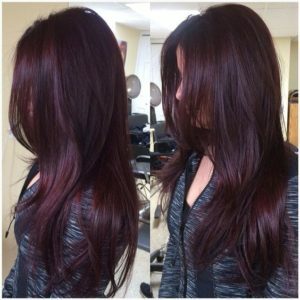 This reddish brown hair color is cooler than auburn, and often features blue or violet undertones. 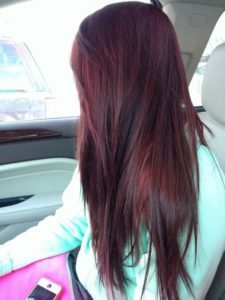 Mahogany hair color looks incredible against cool toned skin, and helps to bring out blue and green eyes. If you’re thinking about going mahogany, be aware than all red hair colors tend to fade quite quickly. 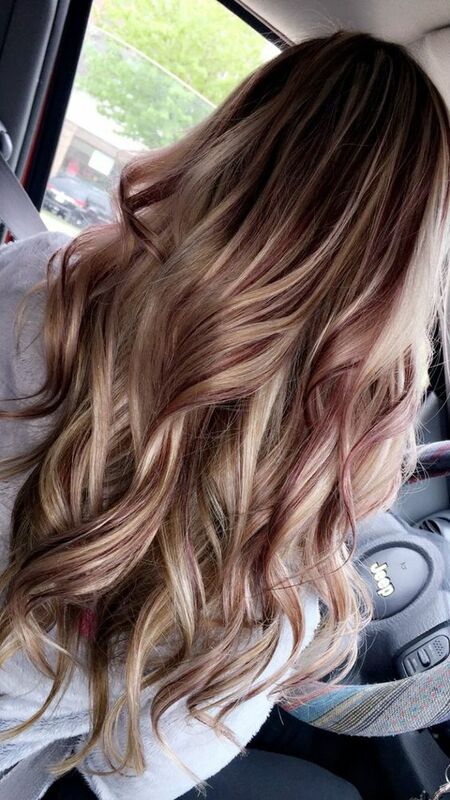 To keep your color around for the long haul, wash with sulfate-free shampoo and water that’s on the cooler side. 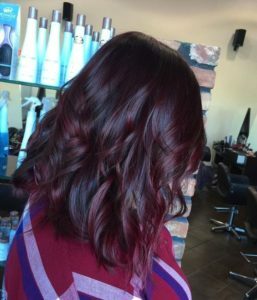 Even with your best efforts, you may find this brilliant color looks dull faster than others, but we still think this cool, sultry reddish brown is totally worth it. 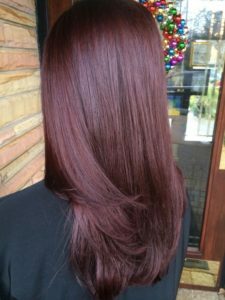 This mahogany hairstyle features a nice blend of medium reddish brown with some darker colors underneath, making it a versatile style that won’t look flat or boring. 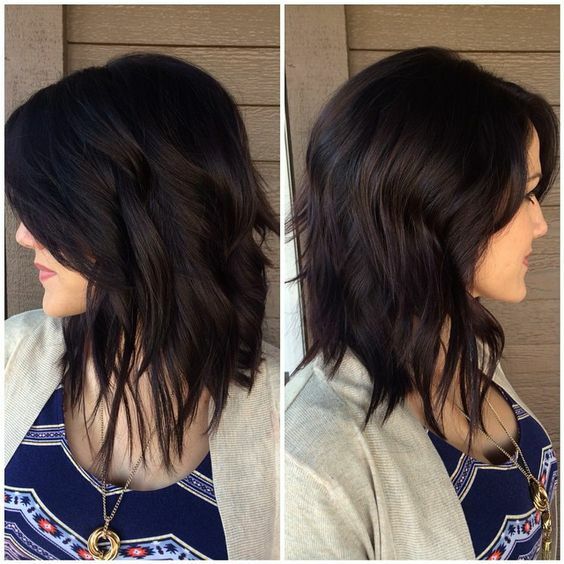 Dark mahogany is a great choice for women with medium skin with cool undertones. 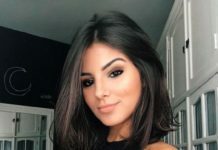 Subtle highlighting frames the face in this style, which can play up warmer notes in your eyes or makeup. 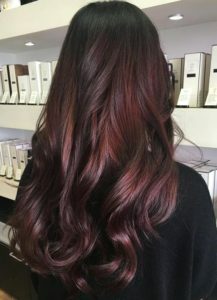 If you want to get extra dark and moody with a mahogany hairstyle, use the cool reddish brown as your base color and add black lowlights in a balayage or ombre technique. 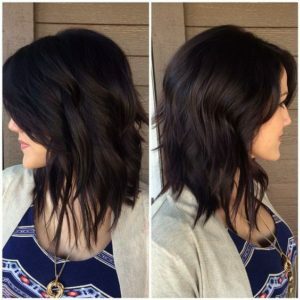 The end result will be a dark but deeply dimensional look that’s perfect for winter. This mahogany keeps things extra cool, and picks up lots of violet tinges. 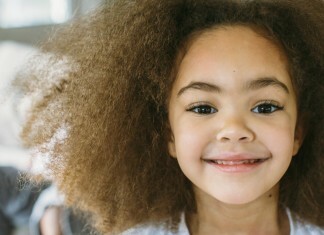 We especially love this shade for bringing out dark green eyes. 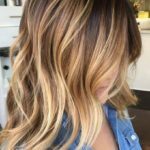 If you want to add a touch of mahogany to your look without completely abandoning your dark brown base color, this balayage style features just the right amount of highlight. We love this color for a fall or winter change-up that looks fresh without being too summery or bubbly. 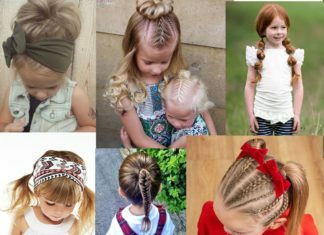 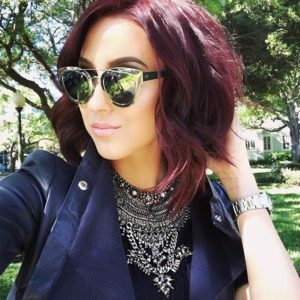 If you’re looking for a mahogany hair color that’s vibrant and attention grabbing, there are a ton of mahogany styles that fit the bill. For long hair that’s eye-catching but not overbearing, try a single color style in this ultra bright shade. This dark mahogany pulls tons of purples, making it a nice choice to play off of medium olive complexions. 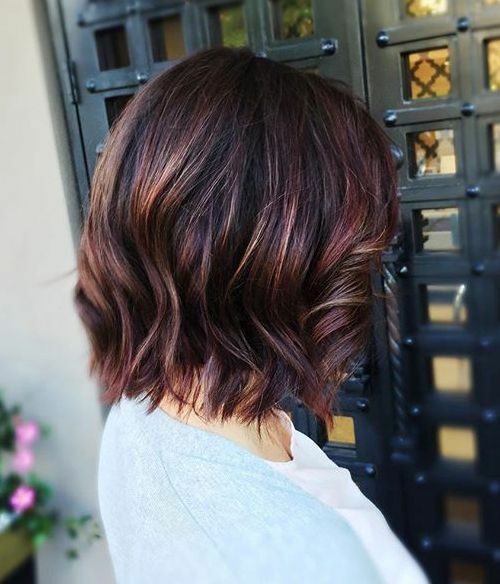 If you’re looking to update your bob hairstyle without drastically altering its length, this color is all the pick-me-up you’ll need. 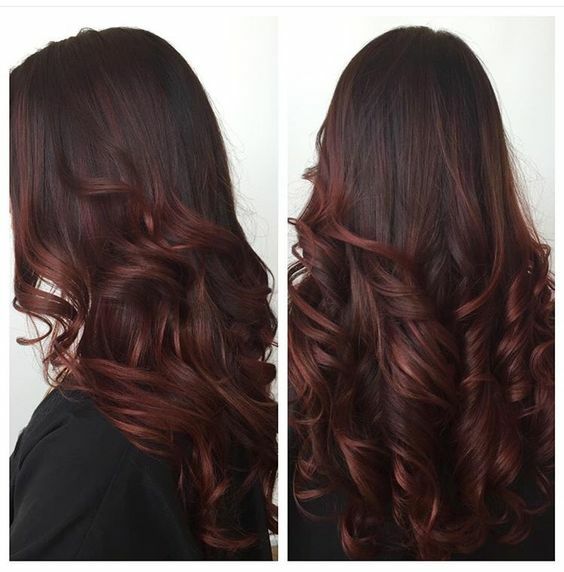 Ribbons of blonde highlights help to accentuate the curls in this mahogany brown hair color. 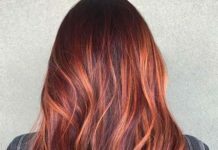 If you’ve been wearing a reddish brown shade for a while, this is the perfect way to upgrade your color for summer without going fully blonde. These deep mahogany features tons of purple tones, making it a good choice for women who have neutral undertones in their skin. A deeper shade like this also works well on darker complexions, but might wash out anyone who’s very fair. A mahogany color melt puts the perfect finishing touch on this sleek blunt bob, looking fun and luxurious but still grown-up and mature. 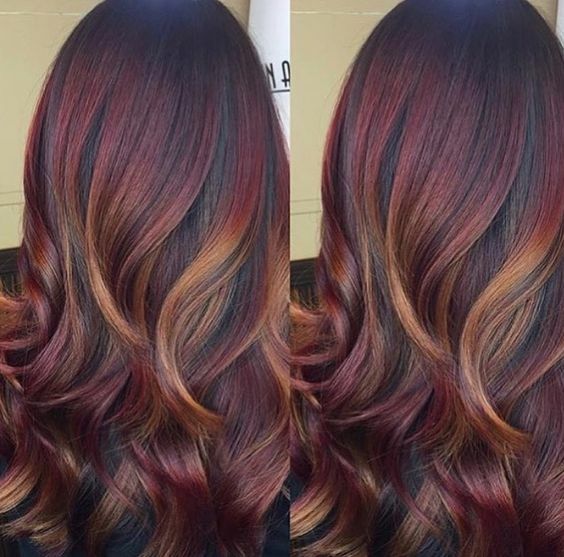 Mahogany babylights help to warm up this darker brown hairstyle, and look incredibly natural thanks to their sparing placement throughout the crown area. 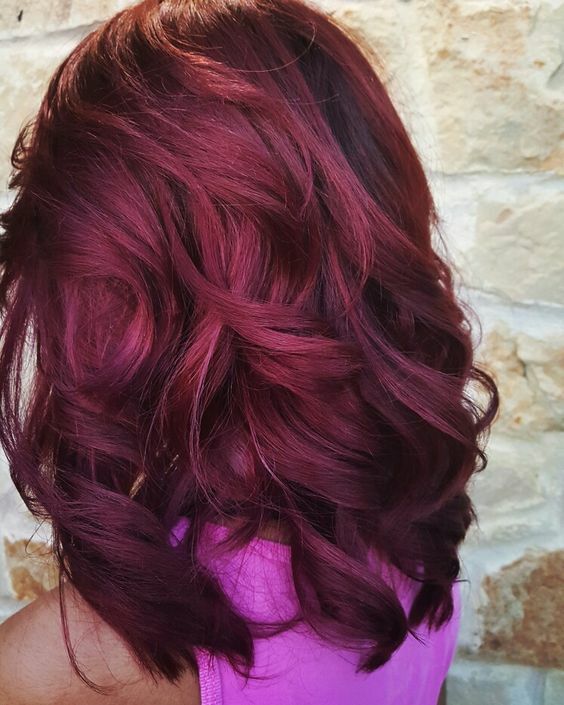 This bold ombre look pairs a very purple tinged mahogany over a dark brown base color. 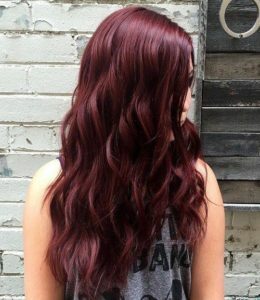 If you aren’t sure if mahogany color is something you want to be constantly touching up, this style allows for easy growing out. 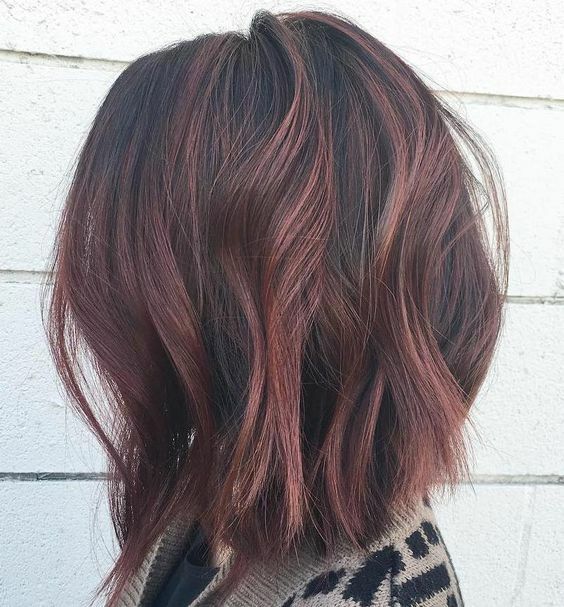 In a surprising color combination, this look features a warm copper ombre over a mahogany base color. 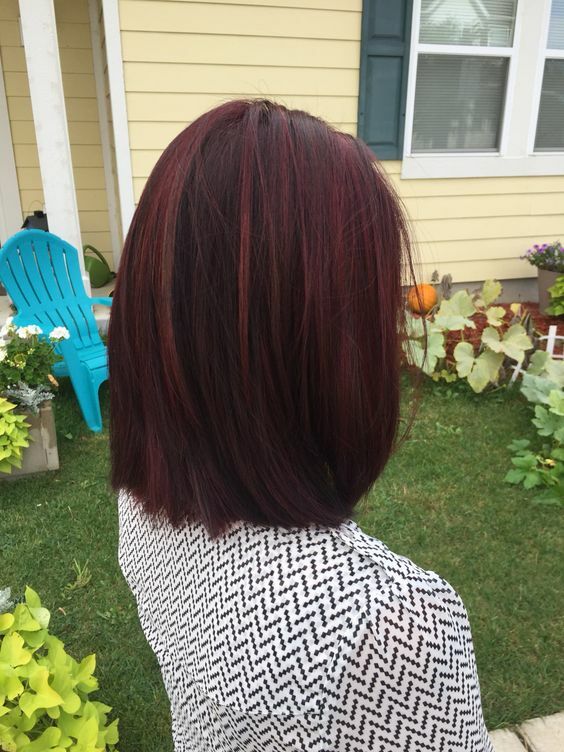 Give this a try if you’re going for something unique and eye-catching. 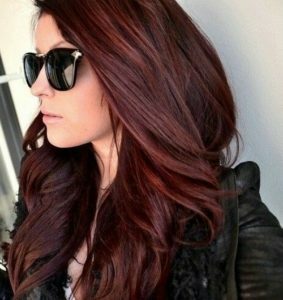 This medium mahogany brown hairstyle almost looks auburn, but features more cool notes than the classically warmer style. 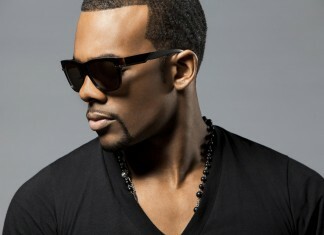 Medium and dark mahogany shades tend to look best on deeper complexions. If you’ve got more yellow or golden tones in your skin, go for a true mahogany like this. 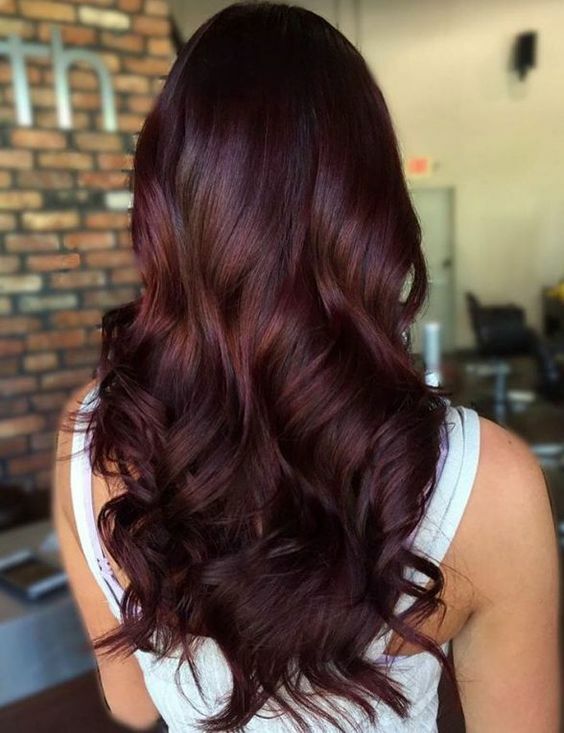 While women with green undertones might prefer a mahogany color that’s got notes of violet in it. This mahogany look features a soft ombre color that’s only a few shades lighter than the hair’s roots, giving it a natural look despite being a gorgeous salon creation. 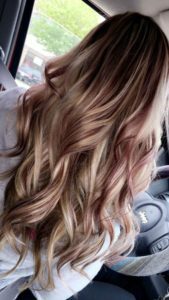 With gold ribbons of contouring in the middle of rich mahogany strands, this red and blonde hairstyle looks more like an airbrushed work of art than a regular color style. This medium shade of mahogany brown is one of the most versatile hair colors on our list, and looks nice on fair and medium complexions with both warm or cool undertones. This cinnamon brown hair is warm and inviting, making it a fall favorite among brunette beauties. Mahogany highlights add a little something special to this look, and make an excellent addition to most medium brown hairstyles. 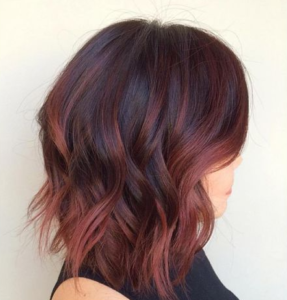 With an ultra dark shade of mahogany at the roots and a copper tinged ombre, this rich and sultry hair color plays perfectly off of Ashley Greene’s skin tone and brings out her brilliant eyes. 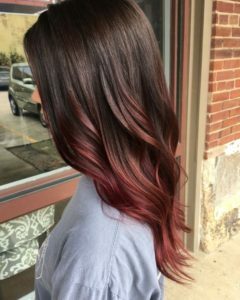 A dark mahogany base color with hints of warm auburn balayage makes this long hairstyle the perfect mix of both warm and cool red tones. These rich mahogany roots provide the perfect starting point for a color melt style that’s coppery blonde at the ends. 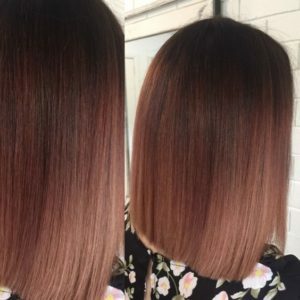 Mahogany and copper are both very trendy right now, but you won’t see many other styles combining the two together like this. 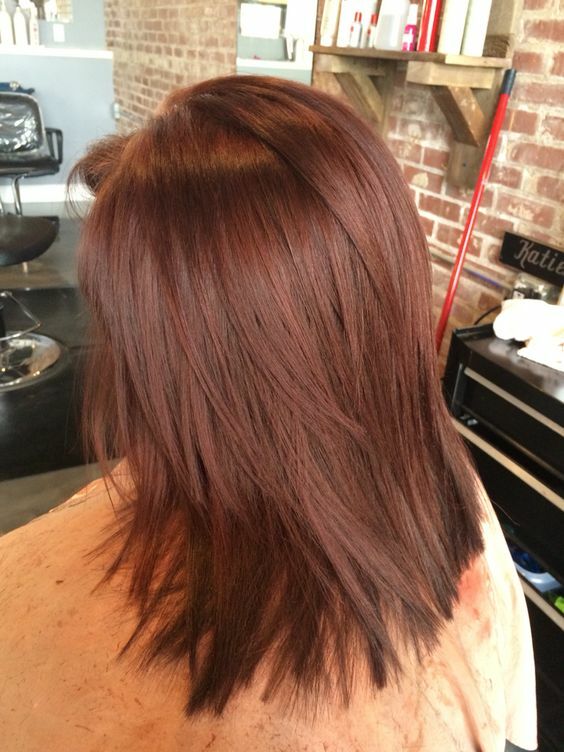 This chocolate brown style gets some delicate additions thanks to subtle mahogany brown highlights. Give this look a try if you’ve never had red hair and want to start with something low-key. 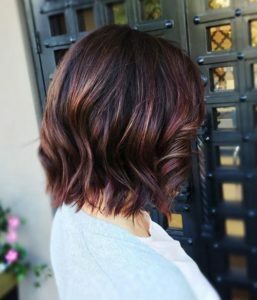 A professional flamboyage technique can create incredibly natural looking highlights within your mahogany hairstyle. 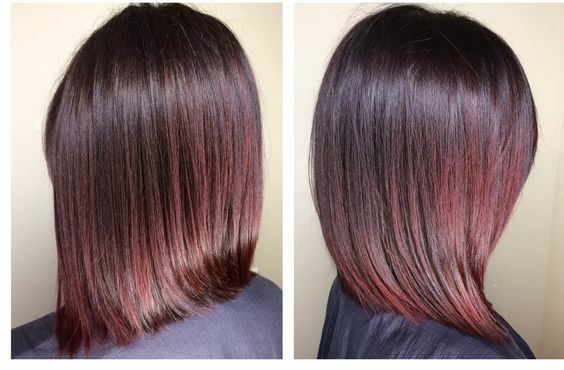 If you’re looking for color that’s dimensional but subtle, head to your favorite salon and ask about this latest coloring technique. 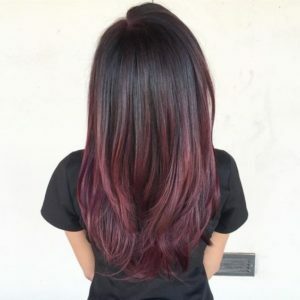 This intense mahogany is a good choice for women with medium to dark skin tones, and shows how a a single tone of mahogany can create a bold and sultry look. 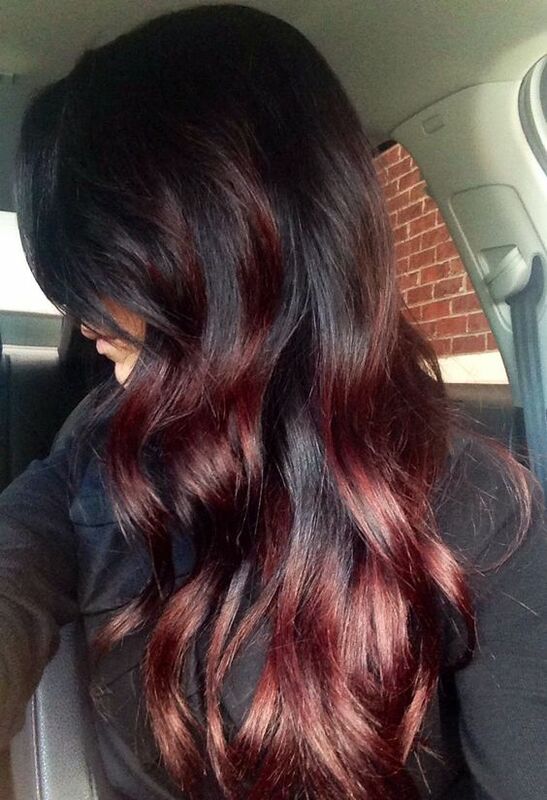 A touch of cool red underneath this natural black hair gives it a mahogany shine in the light. 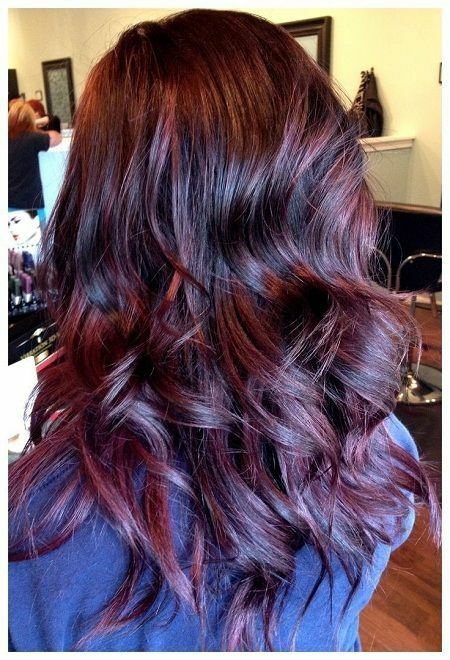 We love this hair color for raven haired beauties who don’t want to lose their edge by going for a much lighter style. 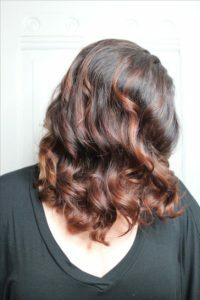 Mahogany ombre brightens up this medium brown hair, creating a bold look that will stand out from the more common blonde ombre looks. 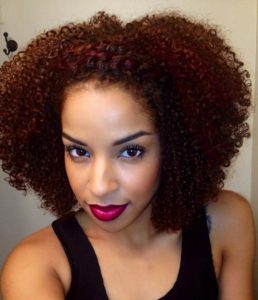 Women with naturally black hair are often hesitant to go for a completely new color from roots to tips. 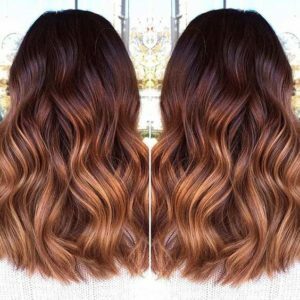 But balayage highlights are the perfect way to enhance your dark locks without needing to head back to the salon every 6 weeks. If you’ve got medium or dark skin with cool undertones, this mahogany balayage will enhance your hair while keeping its dark and sultry essence. 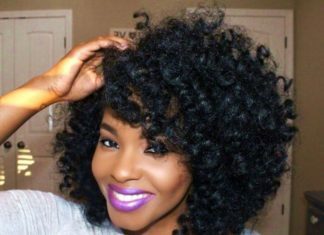 If you’re looking for a more striking way to pair mahogany with your natural black hair, try this ombre look. 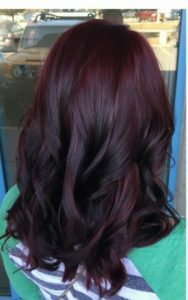 Medium mahogany contains cool tones but is still bright enough to stand out from the black base color. 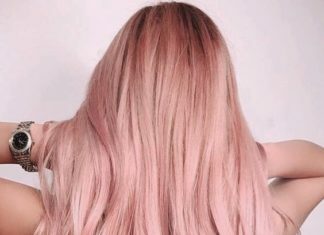 Light haired ladies may feel left out of the mahogany trend, but you can use the shade to create dramatic lowlights in an existing blonde style. 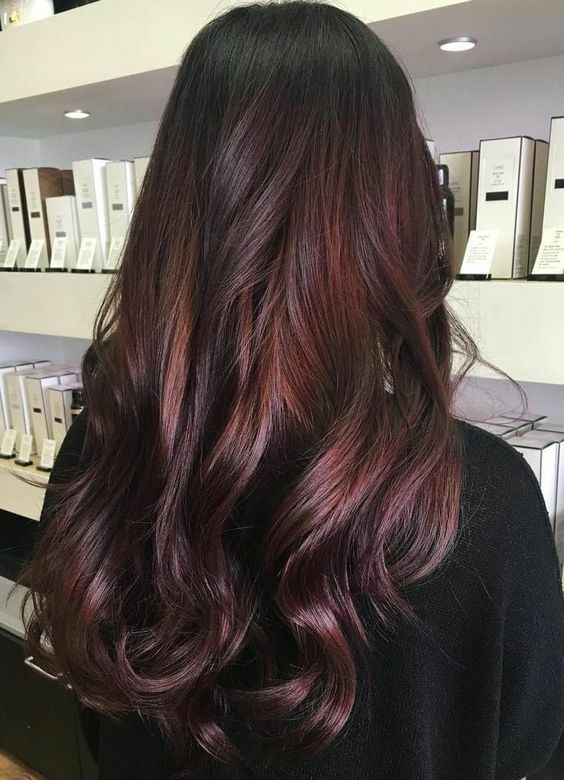 Unlike the ultra trendy ombre and balayage techniques, this look distributes mahogany lowlights from roots to ends, create extra depth in curled hair. 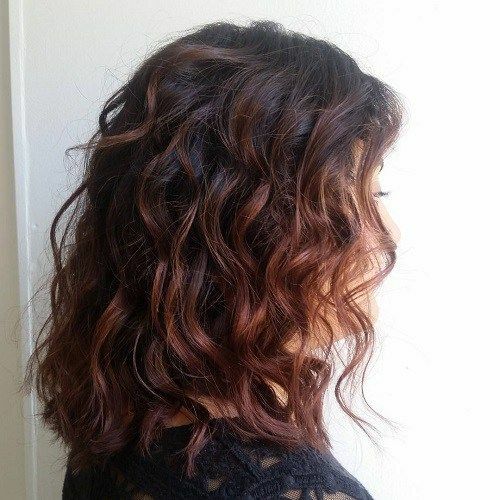 This curly hair gets just the right amount of extra love from some mahogany balayage color. Playing with different shades of intense reds makes this style more natural looking despite it being made up of very unnatural styles. Be prepared to refresh this color often, as its vibrancy will fade with every wash.
Mahogany and mauve play together in this gorgeous balayage style. This is a great look for anyone who wants just a few purple notes in their dark brown hair. 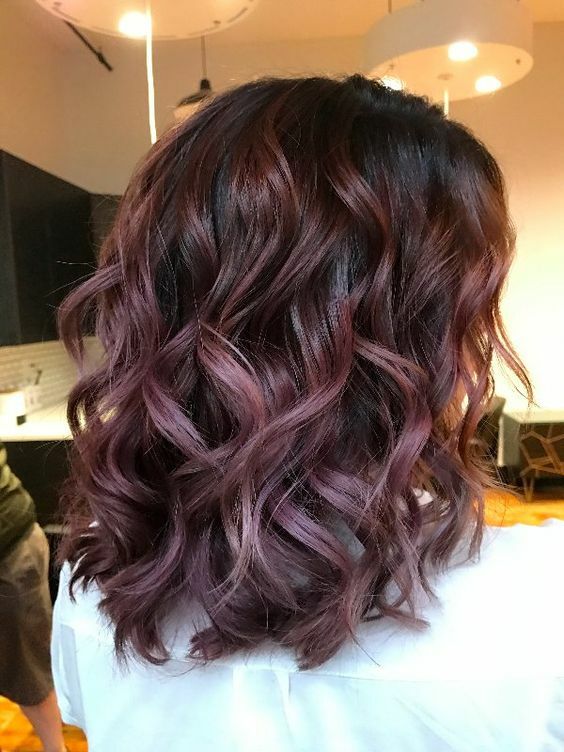 Lots of violet tones make this mahogany balayage a great option for women who have olive complexions and brown or green eyes. 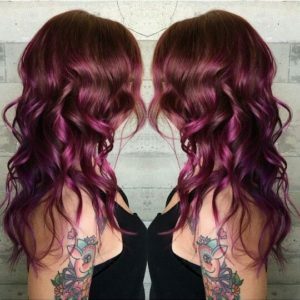 If you’re flipping a coin trying to decide between trendy mahogany and electrifying violet hair, this look brings them both together. Cool mahogany roots make way for a vibrant violet ombre in this intense, rock-and-roll style. A nice muted finish helps this mahogany balayage look cool, subtle, and ultra sophisticated. 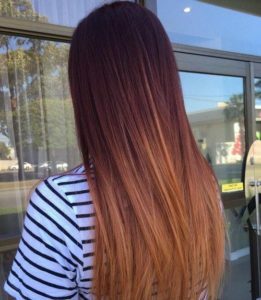 Although mahogany hair color looks great with cool skin tones, this kind of muted shade will also compliment warmer complexions.